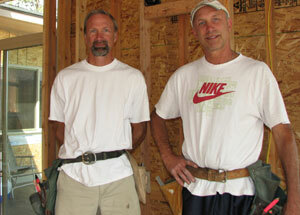 Brothers Mike Schramm (left) and Mark Schramm have been building Lake Chelan area homes together for 19 years. It seems only fitting that a homebuilder who is vigilant about not wasting energy would build his house in Karma Kanyon. Good karma – and good energy savings – is anticipated for Mark Schramm’s home, now taking shape among the grapevines on the south shore of Lake Chelan. Schramm and his brother, Mike, are the owners of Green Gables Construction. They’ve been building homes in the area for 19 years, but this is the first home Mark has built for himself. Ownership of a lot in Karma Kanyon ensures a killer view of the lake, hiking trails out the back door, use of a community pool and sipping privileges at Karma Vineyards. But when it comes to comfort, it’s what’s inside the three-bedroom, 3,200-square-foot house that counts. Mark and Mike are incorporating energy-efficient details that cost a little more now but will save a lot in the long run. • Placed four inches of rigid insulation under the entire concrete slab foundation. • Used AARX insulating concrete forms (ICF) for the basement walls which, in addition to being highly energy efficient, are easy to install, Mark said. “They snap together like Legos and there’s no furring; you can put sheetrock right on top of it,” he said. • Caulked and sealed every possible source of air penetration, including the base of stud walls. • Installed double-pane, argon gas, low-e windows. Triple pane windows would have been nice, Mike said, but are expensive. • Used double-wall construction on exterior walls. Instead of 2”x6” walls on 16-inch centers, which is standard, the contractors built two 2”x4” walls with 24” spacing. This leaves room for blown-in fiberglass insulation with an R value of 40-plus (energy code calls for R24), and plenty of space for wiring and plumbing, they said. They plan to insulate the ceiling to R60 (energy code is R49). • Built overhangs slightly larger than standard to reduce direct sunlight into the home. Keen Climate Change of Entiat is installing a ductless heat pump system – one outdoor unit with three interior “heads” – for heating and air conditioning. Keen also is equipping the house with a heat recovery ventilator designed to provide fresh air and improved climate control, while also saving energy by reducing heating (and cooling) requirements. The Schramms favor these units because they are super efficient and very quiet. Mark is not planning to add solar modules to his home, but Mike placed them on his, in Union Valley. That house, built in 2000, uses solar power to heat water. In the winter, solar power also heats the water in the hydronic tubes used to warm Mike’s basement. The brothers built one small house, also in Union Valley, that was so tight “a light bulb would have heated it,” Mark said. Mark and Mike have built other homes that lean toward green, but none that incorporates aspects such as minimal use of off-gassing materials, reclaiming water on the home site, or integrating renewable energy. But they do incorporate many energy-efficient measures. “People say, ‘Power is cheap here,’ Mark said. “But why not do something good when you can? “Although very energy efficient, what we like about the last house we did this way was how incredibly quiet it was,” he added. Mark expects his house to be the same. Makes for good karma. This entry was posted on Friday, July 6th, 2012 at 10:44 am	and is filed under Construction, Energy conservation, Heating and cooling. You can follow any responses to this entry through the RSS 2.0 feed. Both comments and pings are currently closed.